» To visit Blue Mountain, please click here. *BMC celebrates their 25th Anniversary and the re-opening of the Indian Lake Theater! To watch a short video from the celebration, please scroll below or click here. 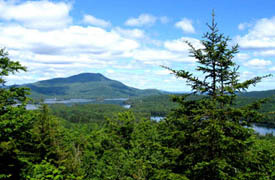 Blue Mountain Center (BMC) is an artist, writer and musicians retreat located in Blue Mountain Lake, high in the picturesque Adirondack Mountains of Northern New York State. 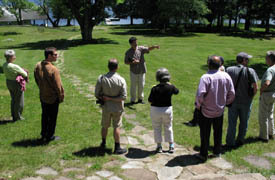 The Center, on the adjoining Eagle Lake, provides, through a competitive selection process, four week artist, writer and musician residencies. During the summer and fall artists in almost every medium come to live and work quietly in this awesome setting. At the heart of BMC is a giant house with a tremendous kitchen, fantastic dining room and a great living room. Every night all the artists in residence and the Executive Director Harriet Barlow, eat dinner together. 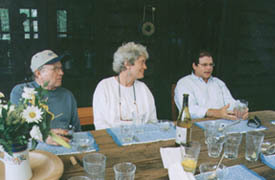 They bond during dinner, sharing intellectual conversation and in many cases forming long-term relationships. The Zwickler family visits Blue Mountain	 On the property, there is a boathouse with rowboats and other recreational equipment. During the summer the water in the lake is as blue as the blue hewed mountain in the distance from which the area gets its name. 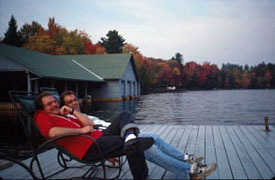 Phil would often sit on an Adirondack chair on the dock, with his buddy Conrad, who often worked at the Center as a volunteer on special projects. 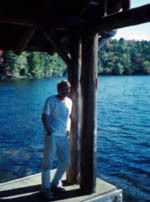 During residences in 1989 and 1991, Phil Zwickler, following the critical success of his first film, Rights and Reactions, wrote production plans for some of his later film/video works, as well as poems, essays and journalistic pieces. He always spoke fondly and gratefully of the bucolic, nurturing and sequestered setting that the Center provided and of the productive and healing work he achieved there. His interactions with other artists animated many of the sensitivities of his later work. He could often be seen on BMC's dock at sunset, strumming his Martin guitar. In the summer of 1993, Phil's immediate family planted a tree at Blue Mountain in Phil's memory. Unfortunately, due to the harsh winters the tree didn't survive. The family determined that we needed to remember Phil at Blue Mountain Center in some other more permanent way. 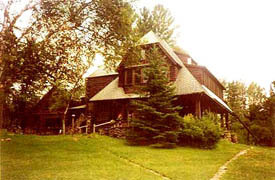 Blue Mountain Center's beautiful main house is called the Clubhouse. In the huge, comfortable, living room the artists could mingle and work during the day. In the evenings they would share their work in conversation or in organized presentations. Much to our surprise, this room did not have state of the art audio/visual equipment. What the Center did have was worn and antiquated . In 2002, the Phil Zwickler Charitable and Memoral Foundation responded to the suggestion of Center staff and donated money to provide modern and multi-purpose audio/video presentation and viewing equipment. This way artists like Phil Zwickler, working in electronic media, could display and share their work while at Blue Mountain Center in a manner worthy of the works themselves. In the summer of 2002 Phil's Mom, Dad, Sister, Brother and spouses made the journey up to Blue Mountain Lake for a dedication. It couldn't have been a more beautiful day. The center was between sessions, so we had the whole facility to ourselves. Conrad, Harriet, and Ben Strader, Resident Manager, received us at the Center. We spent the day like visiting artists, enjoying time and naturefree from the distractions and demands of everyday life. After a homemade luncheon feast, the Phil Zwickler Charitable and Memorial Foundation officially dedicated the state of the art audio and video equipment, which is housed in a handcrafted wooden cabinet. On the cabinet is a plaque with a dedication to Phil. We all sat around in the big, comfy living room and watched some of Phil's filmed interviews on the new big screen T.V. It was particularly difficult for the family to watch, but it brought Phil into the living room with us. He knew we were there at Blue Mountain Lakea place Phil really loved to be. We now know why. Please click PLAY to watch a short video from the celebration. Click on images to read about the project. In order to operate the theater efficiently, we are working on establishing a network of small foundations and town governments to cover any funding gaps. We also initiated a tasteful 'on screen' bulletin board/advertising show before the movies that has had a good response and brings in revenue from local businesses. Our real challenge is figuring out a way to finance the technical advances that will allow us to do more cross-format presentations. Wiring the theater for electricity and internet to allow presenters to be at the front of the theater to do slide shows, or in the back to live-stream videos, and getting the lighting and electrical systems up to proper 'theater house' standards so dance and concert and performance groups can come in and be confident they can do a show. Allen Zwickler attended the BMC 25th Anniversary, which included the re-introduction of the Indian Lake Theater based in the Blue Mountain region. The foundation gave a donation towards the rebuilding of this historic theater. 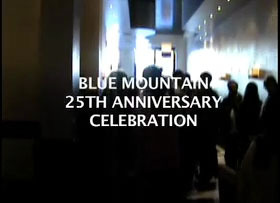 In March 2007, several hundred friends, Residents and staff members gathered in Manhattan to celebrate the 25th anniversary of Blue Mountain Center, an institution that has offered more than 1000 residencies for writers and artists and 150 conferences for activists and cultural workers addressing pressing social issues. In the hub-bub of New York City, they celebrated the serenity of BMC, honoring its longstanding mission to give to writers, artists, activists, filmmakers and composers working for justice a peaceful and nurturing retreat from the distractions of the outside world. BMC staff stepped up their advocacy for the arts in their own community in the fall of 2007 by leading a community effort to revive a defunct movie house in the nearby town of Indian Lake. The theater was purchased in February of 2008, thanks to a grassroots campaign that enticed over 500 donors (including the Zwickler Foundation) to be a part of an effort to save their dissappearing cultural space and convert it into a nonprofit Community Stage and Screen. Over the first year of its new life the theater presented 47 Hollywood, independent and classic movies, as well as 27 special events-including concerts, dance and opera performances, town meetings, yoga classes, kids' programs, and, in partnership with the Indian Lake High School social-studies class, a live-stream viewing of the 2009 Presidential Inauguration. BMC and the Zwickler Foundation are proud to have been a critical part of this local effort to support culture and community in rural America. Today the theater is a dynamic hub for the cultural life of the region. We recently initiated a classic film series for families with a live programming element that has been a big success. In the fall of 2009 the theater will begin a Community Digital Photo Festival for aspiring photographers to submit their photos via email and get a chance to see them on the big screen. Locally established photographers will curate the event, present their work, and answer questions. This next step of creating local content is the evolution of the larger mission to make the Indian Lake Theater a template for building community. » To visit the Indian Lake Theater website, please click here.